Electricians in Rockhampton, QLD, AU can handle all sorts of jobs, from small to big, when it comes to domestic electrical work. If your home project is a large one, you’ll probably want to involve local electricians in the early stages and they can plan, alongside the architect and builder, how the wiring will be set up throughout your house. Single room renovation, or just updating elements of one room, will require less electrical work but hiring qualified, local electricians is still advisable. Electrical contractors will be able to install lighting, fix electrical sockets in place, set up large electrical appliances and wire up systems such as surround sound stereos. Talk to a professional electrician in Rockhampton, QLD, AU about any special electrical projects you have in mind, such as some innovative outdoor lighting or some up-lighting in your hallway, to see if they can bring your idea to life. If a power cut leaves you in the dark, a fuse has blown or your plug sockets stop working, then you can find emergency local Rockhampton, QLD, AU electricians with Houzz that can help you. You can find a qualified Rockhampton, QLD, AU electrician fast for electrical repairs by checking our list of electrical contractors and professionals. Search for your area or postcode to see electricians near you. Find electrical contractors or local electricians on Houzz. 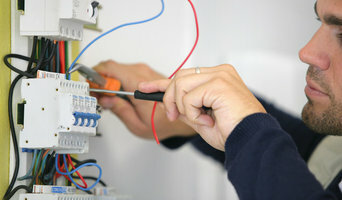 Narrow your search in the Professionals section of the website to Rockhampton, QLD, AU electricians. If you’re planning a large-scale project, find other professionals on Houzz who can help get the job done. Here are some related professionals and vendors to complement the work of electricians: Lighting, Main Contractors, Solar Energy Installation, Heating & Air Conditioning.